From the Warp: Deathwing for sale! That's right folks, I'm selling my Deathwing to fund a new army. It just went up on eBay and will be listed through December 2nd. It's the whole army, the carrying case and any extra painted army tidbits I can find to toss in there. NOTE: The army has been sold folks. 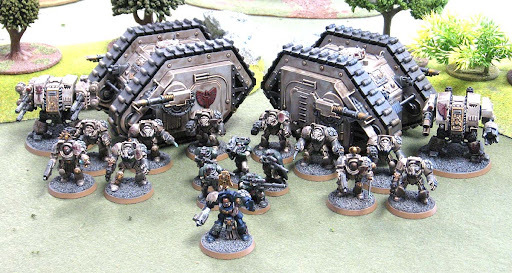 I will be looking into buying the new pieces for my army in the coming weeks. I'll be sure to keep everyone updated as I get to start my new Deathwing. Want to see all my Deathwing related posts to give you a better idea of what the army looks like, they are here. Questions and comments will be answered below, thanks for the support guys. Check it out, bid on it or even buy it outright and help me get started on a new Deathwing force! I'm glad to see you went this route. The idea of stripping perfectly good models to repaint seemed silly. For your sake, I hope nobody exercises the by it now feature, as I think the auction could go over that price. Best of luck to you... looking forward to seeing the new and improved Deathwing force in the near future! Haha, wow. That didn't take long. I clicked the link and it was already sold... about 5 minutes ago! Looks like somebody's keen to get their hands on it, I think you may have underestimated your celebrity selling power! hehe, now this is certainly a better option. But yeah, you coulda gone higher. Ah well, can't wait to see the new creation. Your last post said you wanted to redo a Deathwing army. Is that still the plan? It would be neat to see you build a Daemonhunters force. Figures Ron's army sells in 30 minutes :P I can't wait to see your new Belial model! Now you are the ultimate minimalist, and don't have an army at all. I look forward to the future Deathwing, as I am in the process myself. SC John: I listened to you... and got rid of some of my stuff. Sigismund: The pull of Daemonhunters is strong, but once I read some of the Vraks stuff where the Dark Angels told the Inquisition how things were going to work if they were involved... there's no way I could go with another army now. I am just going to send you my Deathwing and have you paint it, then you don't have to buy any more stuff. You can even play it for a year or so, then just send it back when you are done. SC John: Very funny... you have my address right? Would you like 2 squads first or all 100 at the same time? I think I will send you the whole chapter, I have painted much of the Ravenwing, but the 800 or so green marines is going to take a while. SC John: Let's not be shy then, send it all. I'll get to eventually. I am not sending them until you finish the horsey. SC John: I will finish the horsey then. Reece: The pull of Chaos is strong, but it would only be for the conversion work. I'm just not excited about playing Chaos armies. They just don't have the draw a Deathwing force does for me.